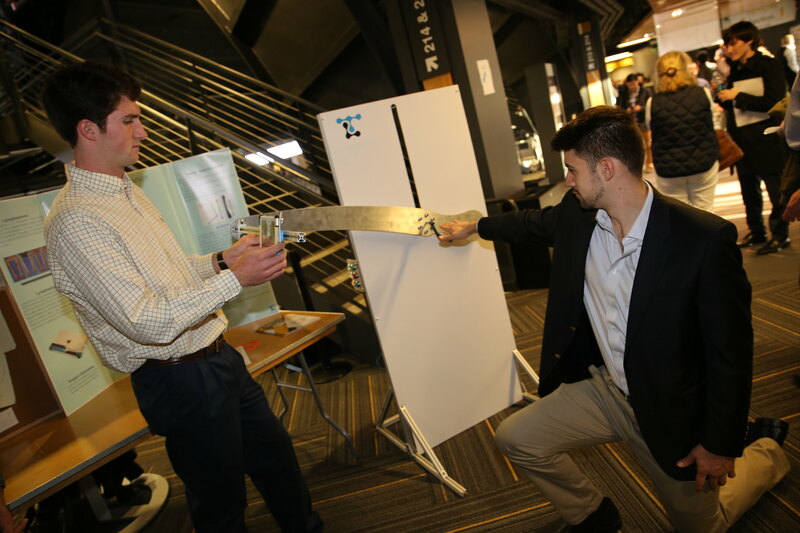 LymphaTech sponsored two Capstone Design teams during the Fall 2018 semester, to gain different creative solutions for the same problem. LymphaTech is a Georgia Tech startup which develops technology to detect subtle changes in the volume and circumference of limbs. Their 3D imaging system is 99% accurate in diagnosing lymphadema compared to the old method of using water displacement and a tape measure. LymphaTech’s scanning application allows people to scan for lymphadema with no training. Problem: There are currently products on the market to help diagnose lymphadema, but most of these options are very costly and/or inhabit a large amount of space. This can make those options impractical for many clinics. LymphaTech has developed an iPad program that can be used to scan a person’s limb and create a 3D model of the limb. Their 3D-scanning software is more accurate than the previous method of detection which depended on limb circumference and water displacement. 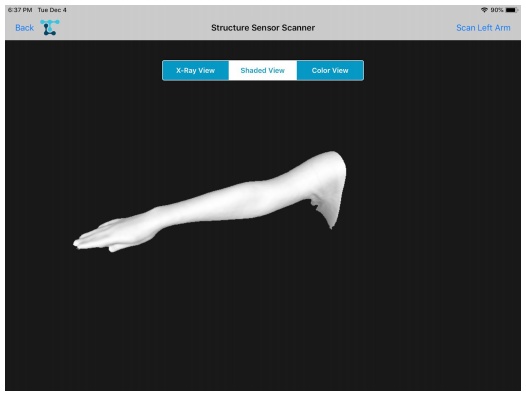 Currently, medical users are scanning patient limbs by hand. This has resulted in inconsistent scans as different users scan at different lengths and users are unable to maintain a consistent distance during the arm scanning process. Projected Impact: Lymphedema is a painful disease that causes swelling in the limbs. Unfortunately, lymphedema is not reversible. Early discovery of the onset of lymphedema is critical for a patient’s health and quality of life. According to LymphaTech’s site, approximately 30-50% of breast cancer survivors and 15% of all other cancer survivors develop lymphedema as a side effect of their cancer treatment. After battling cancer, patients have another disease that they must be cognizant of. Approximately one million patients are at risk or diagnosed with lymphedema. If lymphedema is not caught before 20% of swelling, the patient must have therapy over the course of their lifetime. The cost of managing the effects of lymphedema costs around $250,000. Proposed Solution: Team J. SLIM Engineering is creating a low-cost, automated scanning system for LymphaTech’s lymphedema-detecting iPad scanning software. One of the largest problems that the team faced was creating a solution that fulfilled the requirements while staying under budget. Many of their choices were dictated by price. The final design has an iPad mounted to a rotating arm. 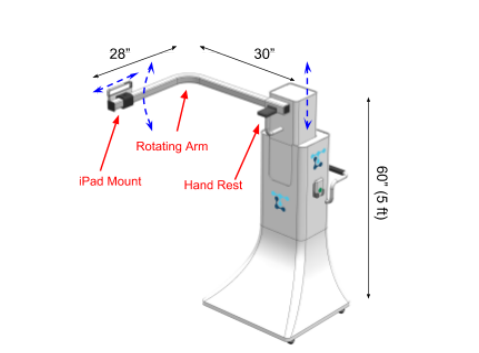 The arm rotates around the patient’s arm and completes a scan in two minutes. The machine has a push-handle on the back and is on wheels so that it can be easily maneuvered around the clinic. Proposed Solution: Team Baumeister decided to build a frame that was sturdy but low-cst, using aluminum and steel. A holder component for the iPad was 3D printed and attached to the metal frame. This frame is large enough for a patient to stand near the frame while the iPad scans the patient’s arm in a circular fashion. The team’s prototype has an immobile design, meaning that it would need to stay in one place at a clinic. An operator can move the arm and height using a series of color-coded buttons located on the side of the frame. Capstone Design Programs Manager, Lucinda Erisman had a chance to speak with LymphaTech’s co-founder, Mike Weiler at the Fall 2018 Capstone Design Expo. Mike was excited by the professional work, communication, and solutions that both teams showed. The teams gave LymphaTech new ideas to rethink their business processes and keep improving. The company has since taken the recommendations made by the Fall 2018 team and is currently sponsoring two teams in this Spring 2019 semester.